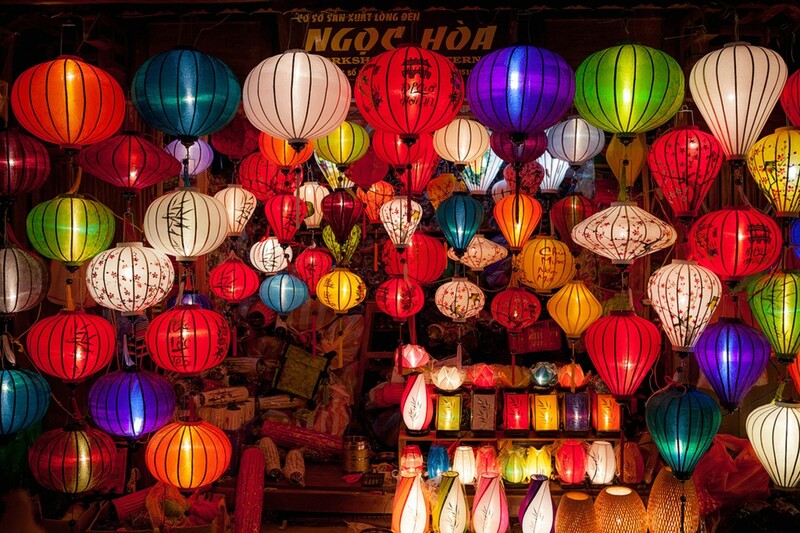 The colorful Hoi An lantern festival held every month on the full moon date is one of the things that put this little town of Vietnam on the tourist map. 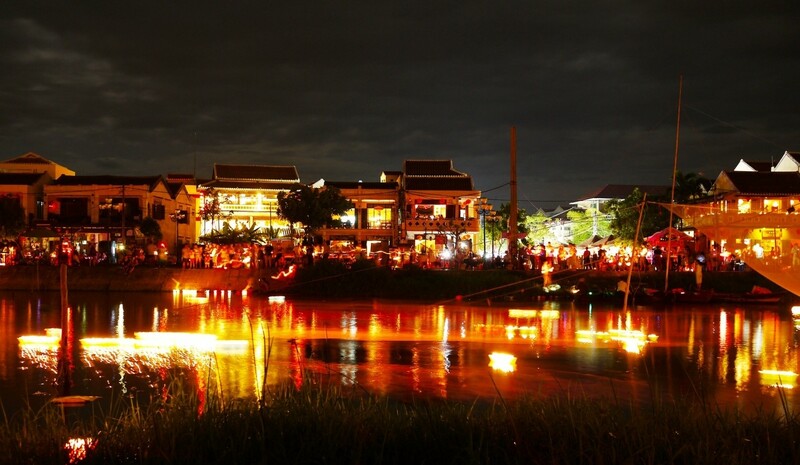 The Hoi An lantern festival is simply a gorgeous tradition. The Hoi An lantern festival is an old tradition of the locals, celebrated on the night of the full moon to honor their ancestors by setting up altars and offering fruit and flowers, burning incense and underworld money (yes it’s a thing in Vietnam) to pray for good luck and prosperity. 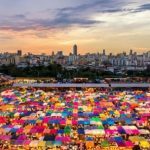 For the tourist, it’s time to see the entire old town transform into a magical melange of flickering candles, multi-coloured lanterns, and lively gatherings. Festivities take place in the old town where motorized vehicles are banned and electricity use is kept to a minimum. Instead, colorful candlelit lanterns providing light on the streets. 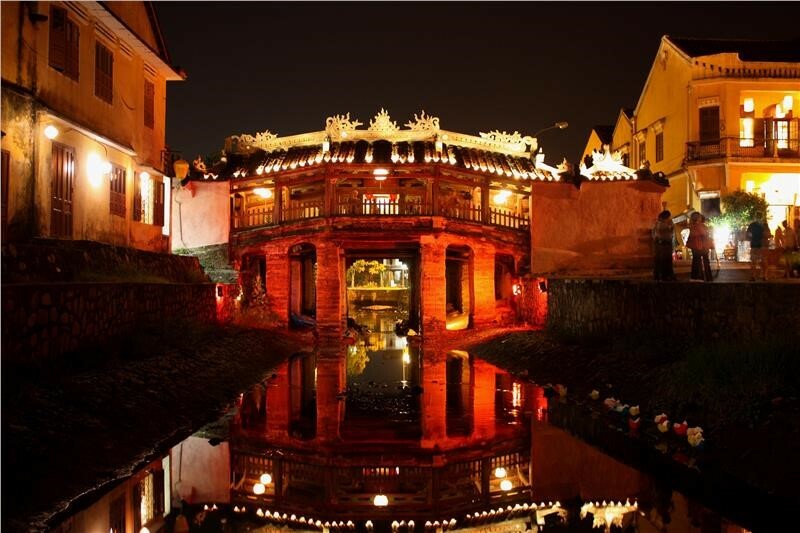 The action is centered in the area between the Japanese Covered Bridge and the Cau An Hoi Bridge, which connects Hoi An with An Hoi, and spills onto the surrounding streets and river banks. 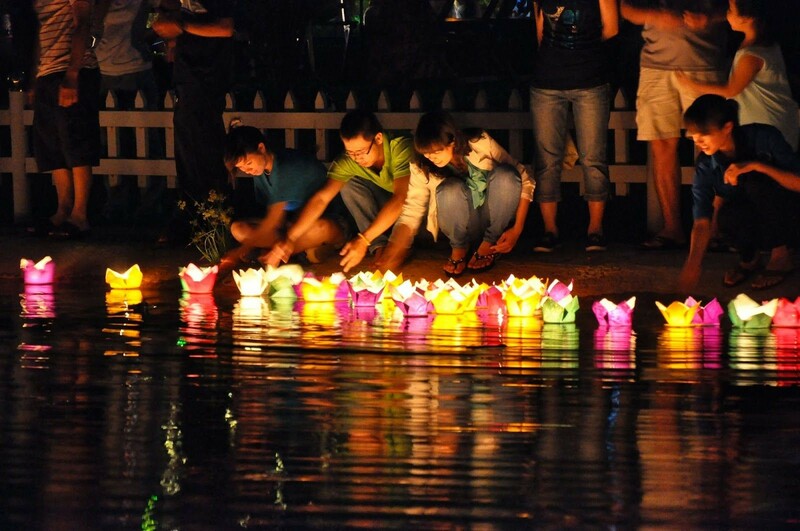 Stay close to the river cause you don’t want to miss the sea of colorful lanterns. The Japanese Covered Bridge is the symbol of this ancient town. You can stand on the wooden platform across from the bridge and take a look at the flickering lanterns floating on the river. Be ready to feel a bit jealous if you are here all by yourself cause this bridge is a very popular spot for newly married couples, they will pass by in little sampan boats (you can take one too for the price of 100.000VND-4USD) to release their lanterns in the hopes of bringing luck to their marriage. There is no place where the atmosphere of hope and romance is more evident than the Japanese Covered Bridge. This is a great time for a temple visit, all of the pagodas in town are awash with activities, all free of charge. You can also visit the Phuc Kien (Fujian) Assembly Hall on Tran Phu Street, an inspiring gathering of local fishing families honoring Lady Thien Hau, goddess of the sea will be hosted there. 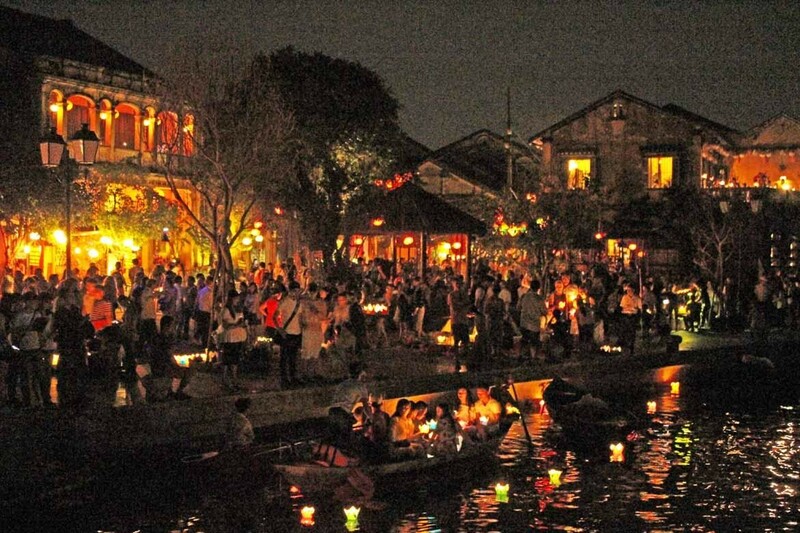 The river banks are packed with lantern sellers, street food stall, street cafes, souvenir stalls, etc. You can find all kind of Hoi An street food such as Cao Lau, banh my (Vietnamese sandwich), spring roll, etc and even some vegetarian version of them. The food is excellent and really cheap, just about 1 dollar per dish. Other entertainment includes local street musicians playing traditional instruments, poetry readings, Chinese chess matches by candlelight and other traditional theatrics and games such as bai choi, a bit like musical bingo. It’s the Lantern Festival, it’s only natural that the lanterns have an irreplaceable part.Releasing a lantern on the river is said to bring happiness, luck, and love.You can buy lantern from any of the local vendors around with the price of 10.000 VND.The river filled with colorful lanterns and sampans ferrying passengers on a scenic cruise through the maze of lanterns is truly a magical scene. 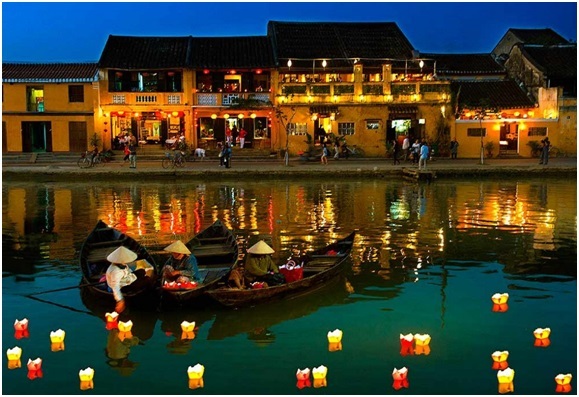 For those wishing to take home a piece of Hoi An’s lanterned charm, the Night Market on An Hoi Islet provides a large array of inexpensive souvenirs and snacks from which to choose. 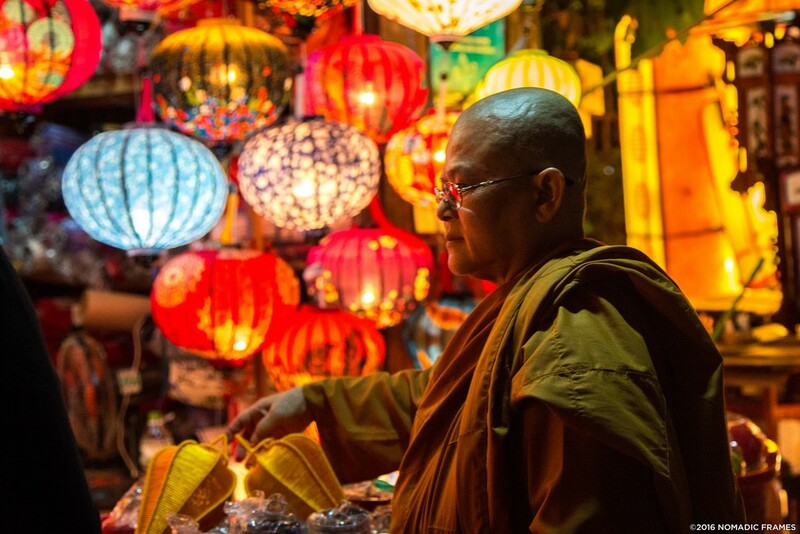 Though largely similar to countless souvenir markets found across Vietnam, Hoi An’s signature lanterns light up the booths lining the entrance to the market, providing a beautiful warm glow. 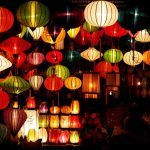 Hope that my article can help you a bit with the planning of your own trip to The Hoi An lantern festival. I challenge you to visit this fabulous event and not be totally overwhelmed with an amazing experience.